Bloomsbury has released a new video interview with illustrator Jim Kay where he discusses his process for drawing scenes from Harry Potter and the Chamber of Secrets for the Illustrated Edition, out today in the United States and United Kingdom! They have also released a few new illustrations from the book that you can see in our gallery! Photos include gnomes, Harry playing Quidditch, a view of Hogwarts, Dobby and more! Bloomsbury continues its landmark publishing of the Harry Potter series with the release of Harry Potter and the Chamber of Secrets Illustrated Edition. This is the first fully illustrated edition of J.K. Rowling’s second Harry Potter novel and continues Jim Kay’s stunning interpretation of J.K. Rowling’s wizarding world. As Harry Potter’s second year at Hogwarts takes him on another magical adventure, readers will be able to enjoy key moments such as the Ford Anglia flying over The Burrow, Harry and Ron’s meeting with Aragog and the battle with the Basilisk rendered in Jim Kay’s unique and glorious style. Key characters also get the Jim Kay treatment including Gilderoy Lockhart, Moaning Myrtle and fan favourite Dobby. After Bloomsbury approached J.K. Rowling with the idea of creating colour illustrated editions of the seven Harry Potter novels, award-winning artist Jim Kay was chosen unanimously by publisher and author to illustrate the books. Jim Kay’s artwork is brimming with rich detail and humour that perfectly complements J.K. Rowling’s timeless classic. Harry Potter and the Philosopher’s Stone Illustrated Edition was published to huge acclaim in October 2015 and has already sold over 120,000 copies in the UK and many more in other languages. The second book will be published simultaneously throughout the world, marking it as another truly global publication. All seven titles in the Harry Potter series are set to become beautiful illustrated editions. Jim Kay and Bloomsbury are already hard at work on Harry Potter and the Prisoner of Azkaban, to be published in October 2017. With colour artwork on every page Harry Potter and the Chamber of Secrets Illustrated Edition is a wonderful addition to the Harry Potter canon, and a dazzling depiction of the wizarding world that will captivate fans and new readers alike. Bloomsbury Publishing has released a trailer for the Illustrated Edition of Harry Potter and the Chamber of Secrets. The book will be released next week, October 4th and you can pre-order it here. Bloomsbury has launched a fun new contest, Unlock Lockhart, where fans can help to unlock an illustration of Professor Gilderoy Lockhart from the new Harry Potter and the Chamber of Secrets Illustrated Edition. The new edition of the book will be released on October 4h. They will Jim Kay’s charming image of Professor Lockhart in three stages and will be giving away three copies of the book too! 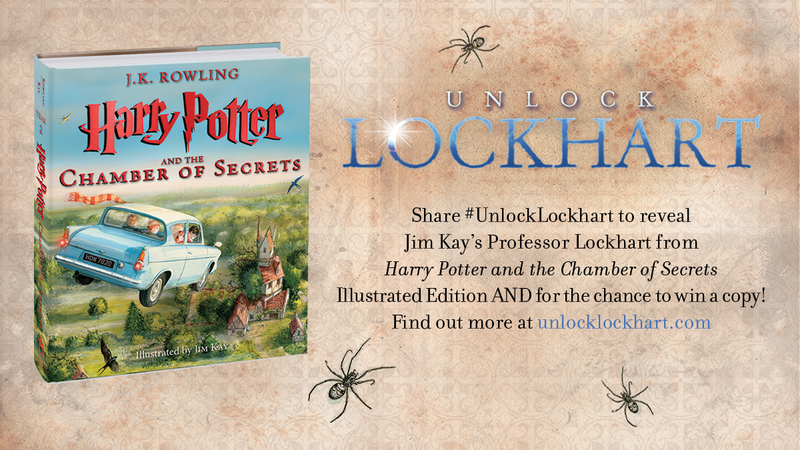 For a chance to win, share #UnlockLockhart on Twitter or Facebook. Read the terms and conditions here. Unlock this exclusive illustration of Professor Gilderoy Lockhart by Jim Kay! Harry Potter and the Chamber of Secrets Illustrated Edition, but you can get a first look at Jim Kay’s celebrity wizard here. 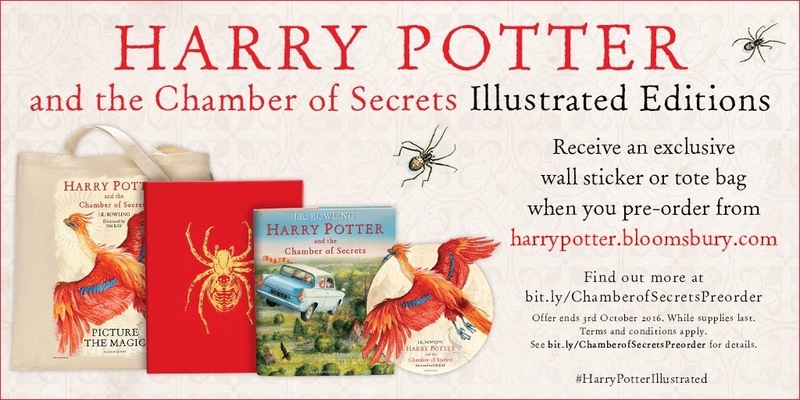 Bloomsbury has announced that if you live in the UK and have pre-ordered (or will pre-order) the Harry Potter and the Chamber of Secrets Illustrated Edition or the Deluxe Illustrated Edition through their store you will receive special merchandise. The book will be released on October 4, 2016 in the US and UK. We are very excited to announce our Harry Potter and the Chamber of Secrets Illustrated Edition and Deluxe Illustrated Edition pre-order offers. There are three offers available to you. Please note, these offers are open to UK and ROI residents only. 1. Pre-order Harry Potter and the Chamber of Secrets Illustrated Edition to receive a Harry Potter wall sticker and 20% off the RRP. 2. Pre-order Harry Potter and the Chamber of Secrets Deluxe Illustrated Edition to receive a Harry Potter tote bag and 20% off the RRP. 3. Pre-order both editions to receive a Harry Potter wall sticker and tote bag, as well as 30% off the RRP. If you have already pre-ordered from one of the above sites, you will automatically receive the corresponding offer to your purchase. If you live in the US you can pre-order the book from Amazon, Barnes & Noble or Scholastic. Bloomsbury have sent over a first look at Jim Kay’s cover art for the Illustrated Edition of Harry Potter and the Chamber of Secrets! The book will be published in hardback on 4th October 2016. Pottermore exclusively revealed some more new artwork from the book, all of which can be seen in our gallery! Pre-Order the book at Amazon or Bloomsbury! 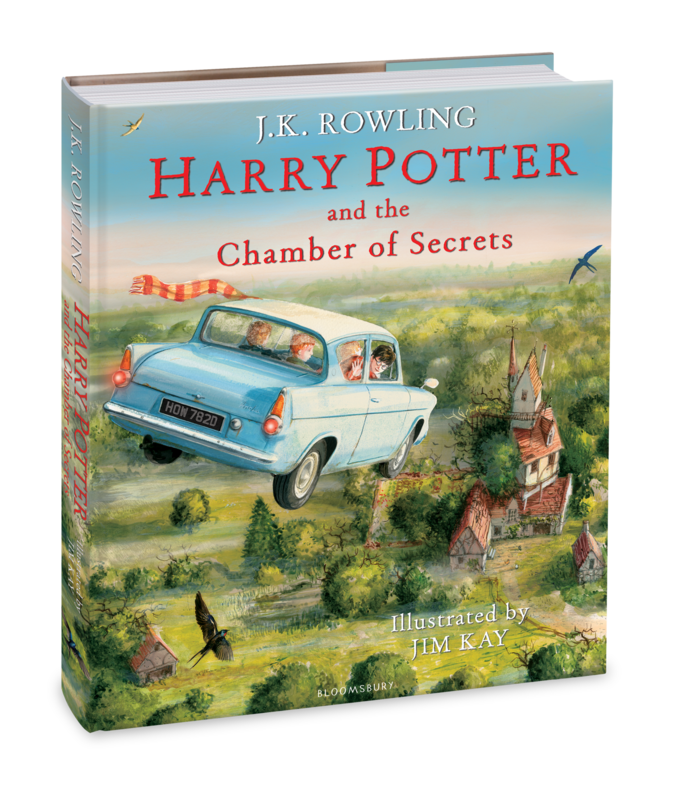 Bloomsbury Publishing is excited to reveal the cover of the eagerly anticipated Harry Potter and the Chamber of Secrets Illustrated Edition written by J.K. Rowling, illustrated by Jim Kay. Scholastic US are using the same cover image and will reveal simultaneously. Illustrated by Jim Kay, Kate Greenaway Medal winner, the front cover image shows Harry Potter flying towards The Burrow in the Ford Anglia. Published globally on 4th October 2016 the hardback edition will include ribbon marker, head and tail bands, illustrated endpapers and over 115 colour images. The illustrated edition will be published in more than 21 languages around the world. All will be using Jim Kay’s artwork and will be joining the UK and the US in bringing this beautiful edition to life. Today Bloomsbury has revealed that sales of Harry Potter books are up 126% in 2015, largely due to all the new hype surrounding the series and their new editions of the books. They hope to further this initiative over the next couple of years. October 2016 will see the release of the Illustrated Edition of Harry Potter and the Chamber of Secrets as well as some other promotions surrounding the new play Harry Potter and the Cursed Child. 2017 will be the big year. To celebrate the 20th anniversary of Harry Potter and the Philosopher’s Stone, Bloomsbury will be releasing a myriad of books. Read on to learn more! A brand new edition of Fantastic Beasts and Where to Find Them will be released in on February 9th 2017, with a new foreword from J.K. Rowling and an irresistible new jacket by Jonny Duddle. Bloomsbury will publish FOUR special editions of Harry Potter and the Philosopher’s Stone to tie in with it’s 20th anniversary in June 2017. Each book will represent one of the four Hogwarts houses. Bloomsbury will also be running a programme of activities and celebrations throughout the year to mark the landmark anniversary. Bloomsbury will commission three new illustrators to create lavish, full-colour illustrated editions of J.K. Rowling’s three Hogwarts Library books, starting with Fantastic Beasts and Where to Find Them in autumn 2017, The Tales of Beedle the Bard in 2018 and Quidditch Through the Ages in 2019. Illustrator announcements will follow in due course.